How to find the right storage space in your home, with the wooden sideboards and cupboards? Nobody likes a clumsy home especially of at the end of the day, after a hectic schedule, you have to clean up the mess. The best idea would be to buy wooden cupboards made of hard Sheesham wood. 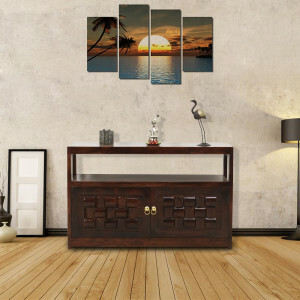 They do not just look good in your drawing room, bedroom or study room, but you can also arrange your books, small figurines, statues, important documents and also your decorative items on these wooden sideboards to make your home look tidy and beautiful. You can now buy wooden furniture online to get the best features of the storage materials, that are sturdy, enduring through different climatic variations, and that give you the ultimate value for money. You can get cupboards that are freestanding, or else, you can also buy sideboards and cabinets that are wall-mounted, and those that can be combined with both wooden and glass structures to enhance the glamour quotient of your living space. 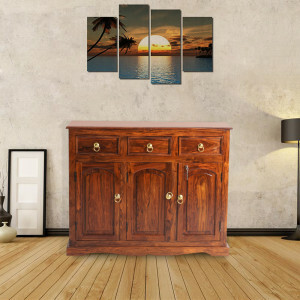 When you search for wooden sideboards online India, you will find a host of options that are magnificent for bespoke finishes and that apply to your neat organization of kitchen items. Right from storing small bottles to glass and plastic containers for spices and condiments, you can choose a solid wooden sideboard cabinet to maximize the space optimization in your kitchen. This readily helps in blending the right interior decoration effect when you go for kitchen renovation. Solid wooden cupboards are the right way to give a warm and conducing effect to your interiors. The right wooden texture with major colour variants can be an additional benefit to your homefront, thereby raising the resale value of your home. 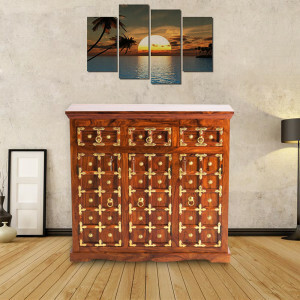 You now have an assortment of stunning wood polishing in brown or black variations of solid wooden furniture that can be customized as per your occasion and requirement. 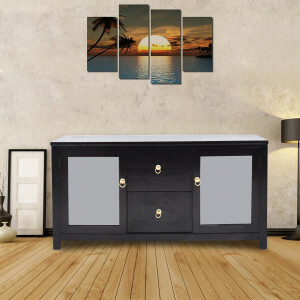 Sideboards and cabinets of multiple variations are now just a click away. With years of expertise in solid wood carpentry, Naveen Arts presents to you an admirable range of storage facilities as cupboards, cabinets, wooden racks, and sideboards online. Apart from all these types, you can now choose wooden bar cabinets, wooden shelves, racks, bedroom and dining sets, wooden mirrors, accessories and temples to spark up the wood collection at your home. The combination of both vibrant and mute colours will definitely be the cynosure of all eyes.